At Least As Currently Formulated, “Standard-Practice” Medicine Will Fail for Many. This Is Not the Right Future for Medicine. A patient of Dr. Mike’s is exercising, modifying and monitoring his diet, generally showing considerable improvement, and rapidly reversing adult onset diabetes. He is on the path to drug-free, peak health. Now, you might wonder, how is it that an insurance company, or more likely, an insurance company’s computer, interferes (secretly) in a doctor-patient relation. It is very unlikely that the insurance company or its computer has had any contact with the patient. This bullying of docs is extremely common, and the reason is “standard-practice” medicine. This is also called standard-care or evidence-based medicine, which all sound very fine until one digs into the details. 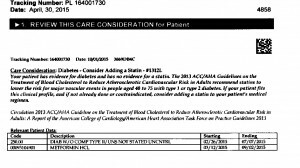 The insurance company computer “decided” that the patient needed to be on statins because of his age and blood test numbers. Period. The “standard” is that a patient in that “bin” gets prescribed statins, and the doc’s personal knowledge of the situation and of the patient is unceremoniously tossed out the window. The pill industry, needless to say, is a huge proponent of “standard-practice” medicine, especially when it involves yet more expensive life-long courses of drugs. “Standard-based” medicine goes all the way back to Hippocrates and his four humors theory. Rigid procedures were followed through the middle ages and survive today. Are we wiser today? The very idea that any single medical strategy could fit every situation is absurd. We are all different, way too different. If I eat starches, they immediately turn to blubber and I head straight toward adult onset diabetes. No starches, and I am about as healthy as one can get. What would “standard-practice” have me do. First, 40% of my nourishment is to come from whole grain. Though these new guidelines are a major improvement over the food pyramid, it’s still the fast track to diabetes for me. Statins? I have had a series of doctors say that if I didn’t take statins, all sorts of scary things would happen. Fortunately, Dr. Mike headed them off at the pass. In fact, my risk of heart problems is zilch. I need statins like a fish needs a scuba outfit. But “standard-practice” says statins. Period. “Standard-practice” medicine is fine for many aspects of disease: treatment of infection, dealing with fractures, heart bypasses, cancer treatment. Generally treating existing problems. But for chronic disease prevention, which is where items like diet, statins, and prevention tend to turn up, “standard-practice” medicine is a disaster, and it’s time this was recognized. For any long term standard therapies or protocols developed, there are going to be people that are harmed. But if it becomes standardized, the powers that be, the insurance companies, the pill providers, the medical associations, bully the doc into compliance. Even the lawyers have skin in the game. Here is a little doctor secret: Among themselves, “standard-practice” is called CYA medicine. The “C” stands for Cover, “Y” for Your, and the reader can speculate on the “A.” Nominally, a doc can’t be sued for malpractice it he or she followed CYA medicine. It takes considerable courage for a doc to take a different route, even if he is sure it is better for his patient. Maybe someday, the insurance company’s computer will be smart enough to actually assess a patient’s health and health trajectory and refrain from the absurd intervention illustrated above. But don’t hold your breath. Medicine today is headed in exactly the opposite direction. The grand wizards at the insurance companies, at the great institutions, the government agencies, and the pill manufacturers are all in agreement: it’s one size fits all. It is hard to overstate how bad this is. It damages, kills really, huge numbers of people. It’s insensitive, and completely disregards the local doctor’s intelligence and understanding. This would be a different approach. The relationship between an individual’s personal vulnerabilities to chronic disease and his or her lifestyle would dictate the treatment. Here, a doctor would measure a person’s internals with blood tests and suggest changes that would ameliorate the situation. Eventually the patient, if compliant, would arrive at peak, disease free health. Probably no pills, probably a long, happy and healthy life. What would be a good name for this sort of medicine? [Hint: The first word should start with a :”Q”]. Enough of this. Quantitative Medicine is exactly that. It is medicine designed to prevent chronic disease, and it is fully individualized. One size does not fit all. Every person is different, and every solution will be different as well. Quantitative Medicine has refined and reduced all this to a set of discovery, interpretation, and modification procedures that fit in a book. Actually, the whole step-by-step process is about a third of the book. And it works for a vast majority of people, maybe 80-90%. Why? Because it takes into account the individual, and “standard-practice” medicine never does. Further, there are no “standard-medicine” protocols or procedures that have anything like a 80-90% success rate. Many are lucky to achieve 30%. Some, like beta-blockers, do more harm than good. Wake up “standard-practice” medicine. Time for something new. My wife recently had a heart attack and that is where we saw standard practice medicine first hand. The first cardiologist read her chart administered what felt like assembly line medicine. After several reactions with the drugs were dismissed as her being over sensitive to what she was feeling and another trip to the hospital, we found a cardiologist who listens and prescribes treatment based on her as an individual and not an “average”.